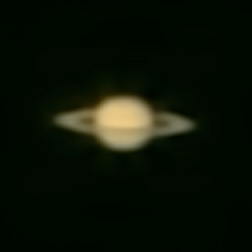 These are the results of my first efforts at taking a picture of Saturn with a Philips SPC 900NC webcam through my Celestron FirstScope 114EQ. This decent little starter telescope cost me just £75 second hand, and the webcam was £20. Above is a screenshot of frames from a video I shot, viewed in Keith’s ImageStacker. From nearly 6 minutes of video I collected about 1000 useable frames. These were sorted and the best 750 frames were stacked. The first two images on the right are examples of some of the frames I chose for the final stack. These have already been resampled to 4 times their original size. Then I manually aligned the individual frames. I tried the ImageStacker auto-align feature but it really wasn’t much good, and while manual aligning by hand wasn’t too difficult, it did take quite a while (probably half an hour to do it properly). 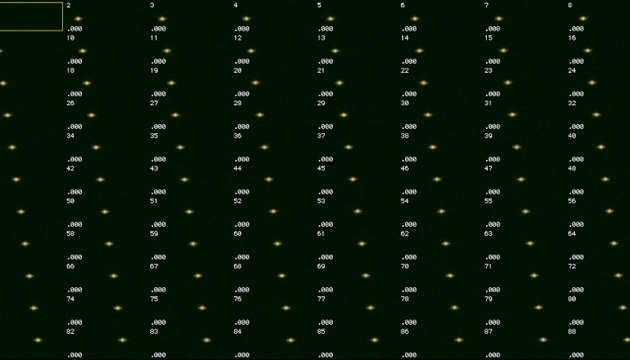 But once they were aligned, ImageStacker seems to do a very good job of ‘stacking’ the images. The third image on the right is a shot of one of the stacks I made – you can see how much clearer the image is than the original frames shown above it, and just how much more detail there is. While you can make out the ring structure in the good frame, you certainly can’t see the ring in front of the body of the planet, which you can in the stacked image. Finally, there are a few tools in ImageStacker to help sharpen up the image. I used the ‘Laplacian Pyramid sharpening’ tool to produce the final image on the right, together with some simple brightness adjustments. The result of sharpening the image was a complete shock – I was just thinking how pleased I was with my stacked image when I started moving a slider-bar in the sharpening tool. Suddenly, the ring structure jumped out at me, cloud textures appeared, and there was even a hint of the ring’s shadow on the planet! Some features came out even better with more sharpening, but at the expense of making the image look way over-processed. So the final image is a compromise on bringing out the detail while keeping the image looking natural.